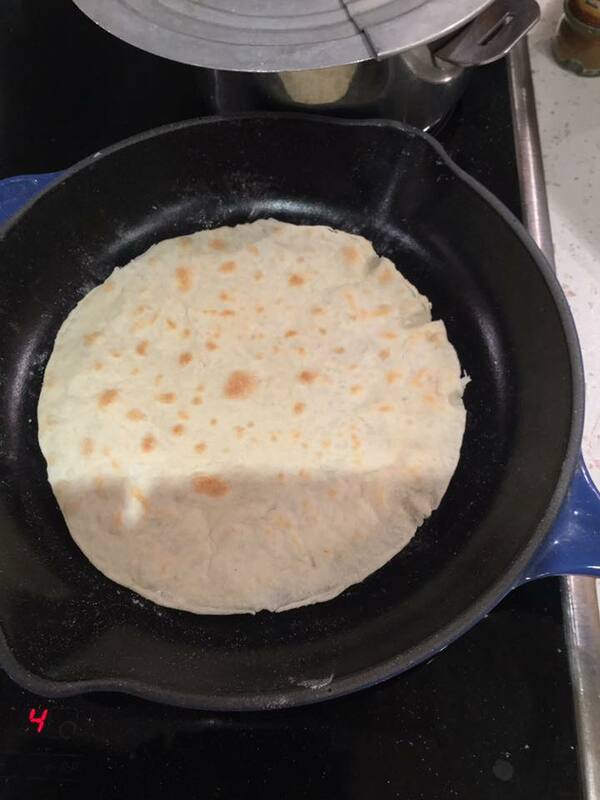 So I’ve wanted to try making wheat tortillas for the longest time, and I finally took the plunge. Part of “Aliette has no brain anymore and can only cook” series of experiments (next one should be pitta bread!). I make absolutely no claim to authenticity for this recipe (I believe one should use beef drippings, or at the very least lard, for the traditional version, but both are in short supply here): I found it on Chef Nini’s blog, which is a lovely resource for all things cooking, and adapted the cooking process to my own kitchen which has no comal or any other specialised equipment (and which I’m pretty sure has the wrong flour). Several recipes I’ve seen on the net have baking powder in addition to the other ingredients. Honestly, for flat things like that which barely rise, I’m happy to skip it–the tortillas have a good tendency to balloon on their own. The dough itself is pretty easy to make if you’re used to making pastry dough or similar; the tricky bit is managing to roll out the tortillas. We developed a DIY system which involves a flat circle of black steel (the bottom of a tart mould, actually), a rolling pin, and the H: he flours the circle, rolls out the ball of dough, and then rolls it out of the circle very carefully, tilting the circle downwards at the same time to gather the dough in his hands. According to him it’s fairly simple (your mileage may vary). The other option is pressing down on the dough with the palm of your hand, and then spreading it out with a thin rolling pin (I’d have used the pin I keep for dumplings rather than the larger Western one. One day I should make a video lol, but see here for an idea of the technique). A short comment on the flour: I use T45/T55 flour with around 10% protein content, I’m guessing the US equivalent would be all purpose flour, and the UK equivalent plain flour. There’s no need for bread flour (the higher protein content of the bread flour is mostly wasted on stuff like this, which isn’t meant to rise: it makes the tortillas marginally more chewy but I should think it’s not worth it). For cooking we use a heavy cast iron skillet, which has the advantage of keeping a steady heat throughout no matter how many tortillas you throw at it. Be careful not to overcook the tortillas or they’ll become hard when they cool down and you won’t be able to wrap anything with them! (also, do keep medium heat. There’s a funky reaction which I call “the pitta effect”, which happens on high heat, where the entire tortilla puffs up and forms a large pocket. Perfect for pitta bread, sucky for tortillas). They don’t keep well once they’re cooked and are best eaten fresh; but you can refrigerate the dough after putting it together (the first time, before putting it into balls), in a bowl covered with cling film. Withdraw it from the fridge 60 to 90 minutes before cooking, depending on the local temperature. 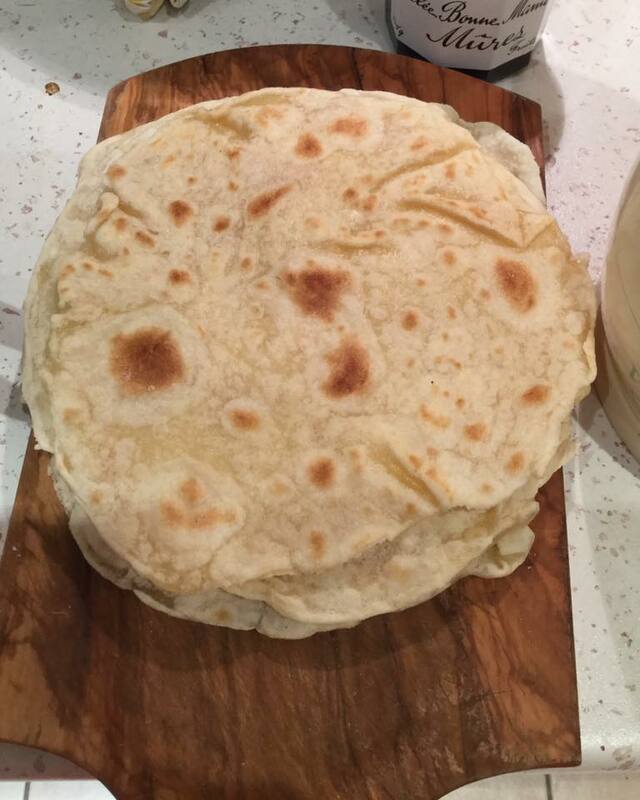 Homemade tortillas--less complicated than you'd think! Rub the butter into the flour until you obtain something a bit "sandy"--all the butter should be absorbed by the flour: given the amounts, you'll have slightly greasy flour. Add the salt and sugar, then the water little by little until it forms a soft dough. Knead just enough to bring the dough together. Let it rest 5 minutes. Divide into 10 balls of equal size. Leave them to rest for 20 minutes. Meanwhile, preheat a cast iron skillet or a heavy frying pan with no oil on medium heat. Roll out the first ball into a circle. Put it in the pan. When it starts developing large puffy bubbles (30 s to 1 min in, don't overcook! ), flip it, and cook the other side a similar time as the first. Repeat with the other balls.